"Fiterstein's clarinet playing was a highlight of the concert, as he spun out the melodies of Brahms' two late sonatas for clarinet and piano. His tone was full and rounded from upper to lower register, and he handled rapid passages with an easy unwavering agility as he shaped every phrase. Particularly fine was his ardent playing of the melodies of the first movement of the Sonata No. 2, warm and lyric without letting the melodies lose shape or the musical narrative lose momentum." "Each player had arresting solos, Fiterstein being the first as a voice rising from a silent hell." 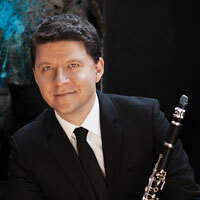 "That and the program finale, a splendid performance of Mozart's Quintet for Clarinet and Strings in A, K. 581, highlighted one of the delights of this year's event: the performances of guest clarinetist Alexander Fiterstein. "Adding a wind instrument to the proceedings, which had previously been all strings, brought a new color and vibrance to the event. And Fiterstein's deceptively easygoing style made him a pleasure to watch as a soloist and in ensembles." "This disc is a sheer delight from the first note to the last." "But in the Brahms trio, the cellist and pianist, joined by Fiterstein on the clarinet, produced a richly textured, poignantly phrased performance. Fiterstein played with a velvety tone and a feeling for the long, swelling melodic line that revealed the uniquely expressive capacity of an instrument powered by human breath. Although Fiterstein is not a member of the ensemble, he fit in with them as if they had been playing together for years, as in the second movement, where he plays an extended duet with cellist Roland Pidoux." "Fiterstein played with a beautiful liquid clarity." "The young Israeli clarinetist Alexander Fiterstein treats his instrument as his personal voice, dazzling in its spectrum of colors, agility and range. Every sound he makes is finely measured without expressiveness. ... In Debussy's ‘Premiere Rhapsody' and Brahms' sonata, Op. 120, No. 2, Fiterstein tapered the classically proportioned phrases with finesse and probed the clarinet's deepest realms. [Shulamit] Ran's ‘For an Actor: Monologue for Clarinet' and [Mason] Bates's ‘Mercury Soul' (a world premiere) pushed Fiterstein's instrument to its limits. Fiterstein roamed through the music's elusive turns of high drama." "Fiterstein made Debussy's First Clarinet Rhapsody sound major and tossed off the ornamental intricacies of Bassi's Rigoletto Variations with burbling brilliance."